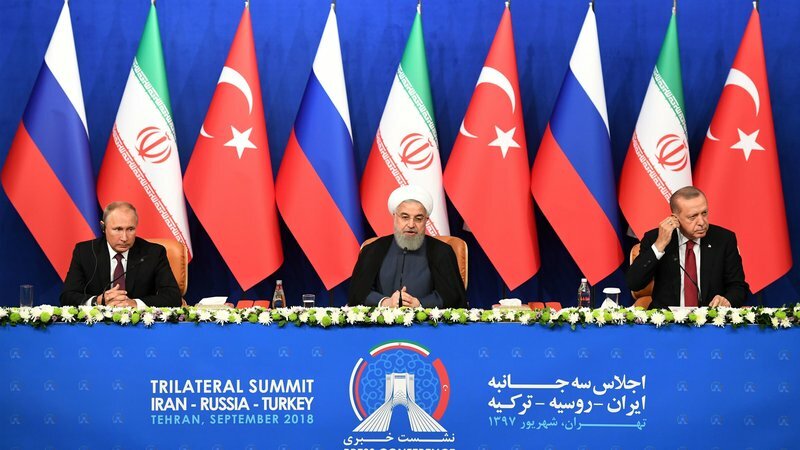 The leaders of Russia, Iran, and Turkey have split in their summit over the future of Idlib Province in northwest Syria. Turkish President Recep Tayyip Erdoğan called for a ceasefire over Syria’s last major opposition area, declared a de-escalation zone by the three countries last year. But Russia’s Vladimir Putin, supported by Iran’s Hassan Rouhani, continued to pursue the pretext for a pro-Assad air and ground assault on Idlib, western Aleppo, and northern Hama Provinces. Erdoğan repeated Ankara’s fears of mass killing of civilians and displacement of many of the estimated 2.9 million people living in Idlib. He said Turkey, which host more than three million Syrian refugees and closed its border in 2016, cannot accommodate any more. Putin responded that a ceasefire is pointless because it will not include “terrorists” — Russia’s term not only for the jihadist bloc Hay’at Tahrir al-Sham but also many rebel factions. I think in general the Turkish president is right. It would be good. But I can’t speak for them, and even more so can’t talk for terrorists from Jabhat al-Nusra [the former name for Jabhat Fatah al-Sham, part of HTS] or ISIS [the Islamic State, which is not present in Idlib] that they will stop shooting or stop using drones with bombs. Putin declared that “terrorists” are trying to disrupt any ceasefire and added the Russian disinformation that rebels are planning a “false flag” chemical attack. This summit is a mess. Clearly there is no deal. Erdoğan is arguing with Rouhani and Putin live on television. The summit’s final statement tried to show unity but held out against any mention of a ceasefire, or even commitment to the de-escalation zone. There was reference to Ankara’s line of “separation between the…terrorist groups and the armed opposition groups that had joined or would join the ceasefire regime” and the covering assertion of “conviction that there could be no military solution to the Syrian conflict”. The statement called on the UN and the international community to step up humanitarian aid to Syria and to help with reconstruction — a key demand of Russia and Iran, whose economies cannot sustain the provision of funds to the Assad regime after a 75% drop in Syrian GDP and more than $380 billion in damage during the 80-month conflict. Efforts must be made to protect and to create conditions for the safe return of refugees, the three countries declared. Will Russia Defy Turkish Objections? As a country that hosts more than 3.5 million Syrians, Turkey will continue to strive for the voluntary and safe repatriation of refugees and a lasting solution, which will create a common ground for all parties to the Syrian dispute. But Putin’s camp maintained pressure for an offensive, with their line between “terrorists” and rebel factions disappearing. A senior #Russia/n diplomat in a private talk following #TehranSummit: "There's no "moderate opposition" in #Idlib left. All the folks who wanted to reconcile w/ #Assad, make deals w/ #Moscow already did so in other regions. What's moved to Idlib are die-hard radicals"
PreviousIs the UK Entering a Lawless Era? Are we? Erdogan first comments were criticism of America for not caring. I mean why are you a die hard supporter of shiite islamist extremists who don’t recognize Israel’s right to exist and have vowed to wipe it out?